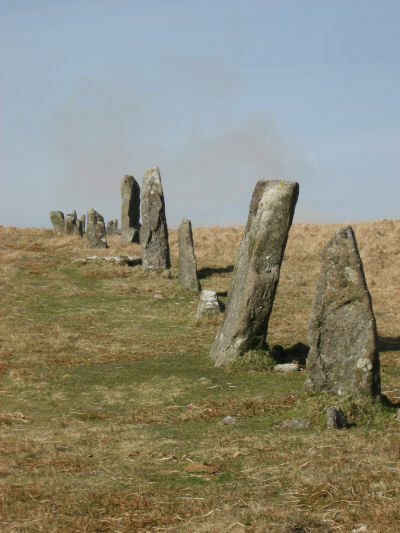 The Stalldown Stone Row is perhaps the most impressive of the stone rows on Dartmoor. 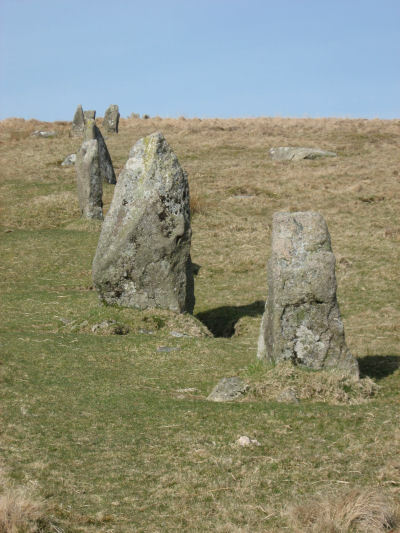 The massive stones of the row ascend Stalldown Hill getting larger and the last few stones over the crest of the hill, known as the Corndon Maidens, are truly megalithic in size with the larger stones being over 2.5m in size. 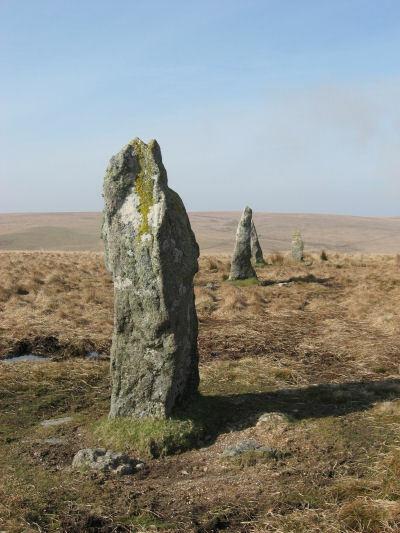 The stones of the row had collapsed and were restored in 1897 by Baring-Gould and the Dartmoor Exploration Committee. 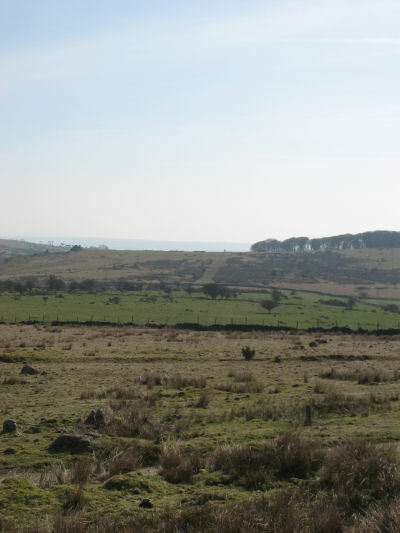 It is one of four rows on the southern moor that are over half a kilometre long and orientated almost exactly north to south, the others being : Butterdon Hill, Burford Down and the Upper Erme stone rows. 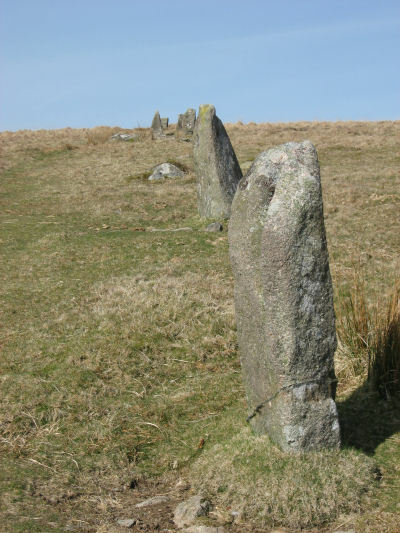 The only row to compare in terms of the megalithic size of the stones of this row is the fallen Piles Hill stone row which is also on the southern moor. The extent and details of the Stalldown row are disputed. 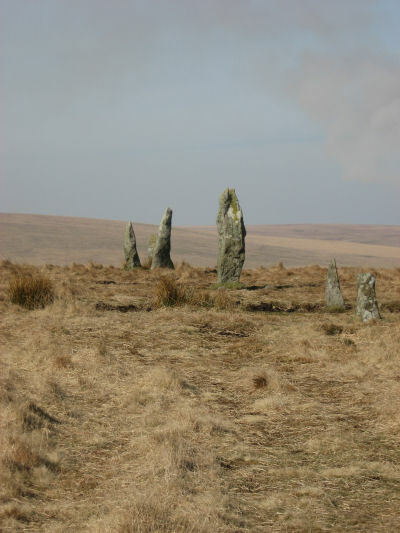 It is considered by many to be one of the few rows on Dartmoor that lacks a terminal cairn or a blocking stone. 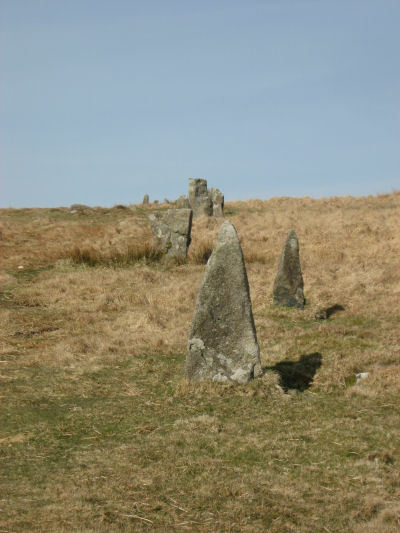 Many accounts of the row restrict the length to the 500m of stones that were restored by the Dartmoor Exploration Committee but it is clear that the row is in fact considerably longer at 850m long. There is also most likely a terminal cairn. 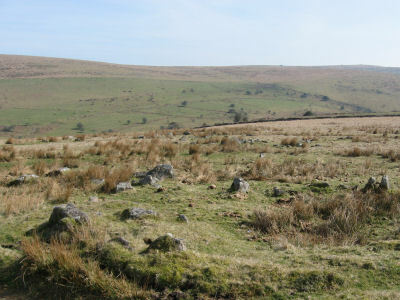 The 4th report of the Dartmoor Exploration Committee in 1897 describes the row after it's restoration. They concluded that the row was in fact two rows. The northern section consisting of 14 stones that terminated in a cairn circle. To a very short distance to the west of this cairn started an associated row that ran almost parallel in alignment down Stalldown Hill. Worth later suggested that the reconstruction of the first section to head to this cairn was mistaken. At 1,193 ft from the south end the retaining circle of a barrow touches the row on the east side of the row; its internal diameter is 13 ft. After restoration, and no plan was prepared previous to restoration, those stones to the north of and nearest to the circle were left in line pointing to the circle's centre. That line should point to the western circumference of the circle, making with the southern part one continuous row, tangential to the circle. There are two cairns abreast the line north of the retaining circle, one with its centre 135 ft away from the row to the east, and the other with its centre 92 ft to the west. Today there is a kink in the row at this cairn which can be attributed to the reconstruction. This can be seen on the right of the plan of the site where the cairn is touching the side of the row in Fig 1. and as the kink at the cairn in the close-up view in Fig 3. It is most likely Worth is correct but it is intriguing to note that the original report is quite insistent that they restored stones only where there were sockets for the stones, "one of which has been left fallen, as its pit-hole was not discovered". 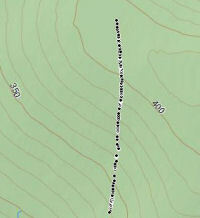 So it is possible that the current arrangement at the cairn is the original layout. Those especially effected [by solifluction] are likely to have been the longer rows descending the slope at an angle, like the northern sections of Butterdon Hill and Shaugh Moor or the southern halves of Cholwichtown and Stalldon (fig 2) where deviation is consistently downhill. Excavation of course would not reveal the original orientation. Alignments of rows descending directly downhill like Burford Down rarely show angular distortion no matter how steep the pitch, though spacing may well have become more irregular. This ineluctable force may well have been a major contributor to the number of fallen stones in any of these monuments. Beyond the Transverse stone there is a possible terminal cairn circle. The Transverse stone can be seen as the large stone almost exactly in the centre of the photo below. 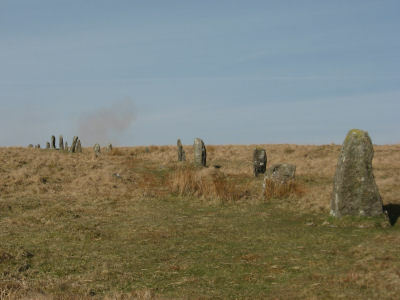 The possible cairn circle can be seen in front of this stone with the row heading up the hill. This has been marked in the second photo. For a larger version of this photo see: Stalldown Row Terminal Cairn Circle. 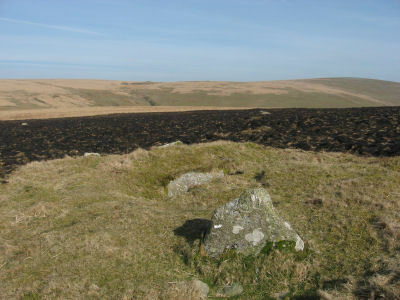 The terminal cairn circle is not listed or mentioned in the Historic Environment Records or in writing in any of the literature on the site. 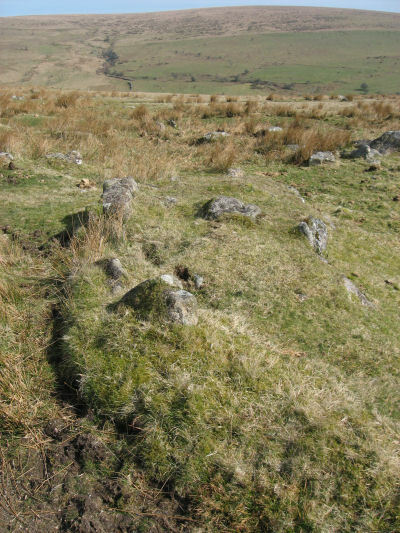 Butler does mention the 350 m of recumbent stones in his description in Vol 4 of the Dartmoor Atlas of Antiquities but specifically states that there is no terminal cairn. [...] the row terminates abruptly at a pillar 502.5 m from the higher end. Originally it may have continued for at least a further 340 m in this direction, for after a gap of about 50 m there are another sixteen flat or buried stones in line at irregular intervals. 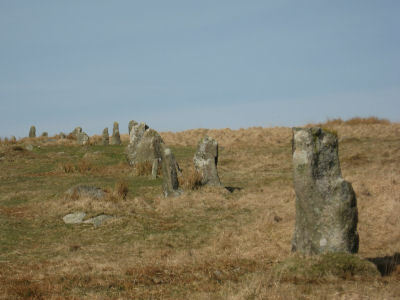 These continue the alignment beyond the end of the Stalldown reave passing about 15 m west of cairn 2(8.2 x 0.6 m), as far as a large block lying across the axis of the row. 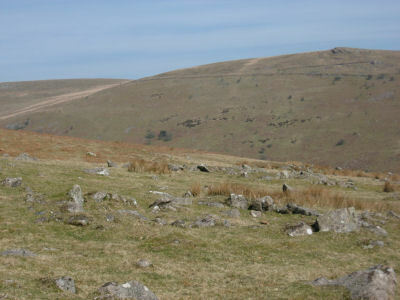 A terminal cairn could be expected at this end to conform with the three very similar long rows in the Erme valley but no trace of one is to be found. However, in the diagram (Butler's Fig 2 p. 21) accompanying the discussion of solifluction in Vol 5 there is the complete Stalldown Stone Row including at it's southern end a marked out small circle of stones labelled "terminal cairn?". It is not mentioned in the text but Butler was clearly aware of it by the time of Vol 5. 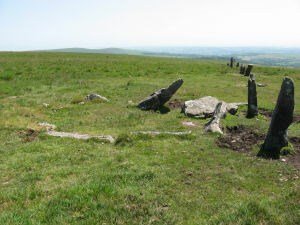 There are another three cairns associated with the Stalldown stone row which are marked in Fig 1. Further away to the east are more cairns at Stalldown Barrow including the shelter structure known as Hillson's House (see: Stalldown Stone Row [Photo Set 2]). Just under a kilometre to the North of the stone row is the Stalldown (N) Platform Cairn Circle and Cist, see photos below. Around 1 km to the west of the row is the Stalldown (W) Platform Cairn Circle and Cist. 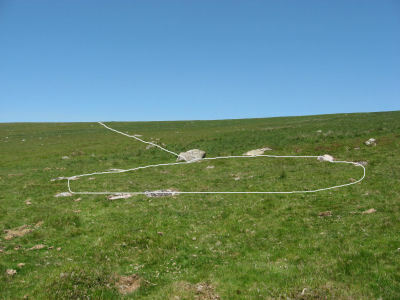 The author revisited Stalldown Row in June 2015 as a direct consequence of reading Sam Goodwin's comments on Facebook on the subject of the true extent of the row and the probable existence of the terminal cairn circle. I would like to thank Sam Goodwin for highlighting this interesting issue and for the permission to use Fig 1. (all rights remain with Sam). Source: Report & Transactions of the Devonshire Association Vol. 29 (1897) . 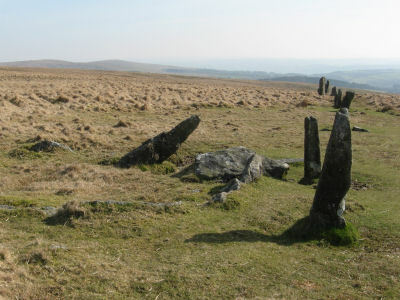 The stone row on Stall Moor is an important example, notable in especial for the large size of the component stones, as compared with the usual size of the menhirs of Dartmoor stone rows. 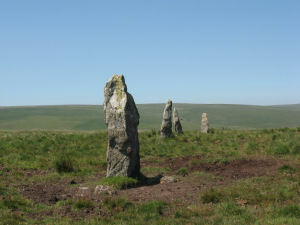 To a great extent, no doubt, the size of the stones was in all cases regulated by the nature and dimensions of the moor-stone blocks available in the neighbourhood; thus on Stall Moor, where the available blocks are all of large size, the row derives an added apparent importance from this fact. This stone row is single throughout its length, and at no place is there any evidence of the doubling of the blocks, which would be necessary to form the so-called avenues. As will be stated below, there is evidence of a composite character in this row, which on examination appears to resolve itself into two associated rows placed approximately end to end. The total length of the associated rows as now remaining is 1640 feet, and the direction from end to end is approximately north and south magnetic. The plan should, however, be referred to for more detailed information on this point. The total number of stones at present to be found in the rows is sixty-eight, of which three have not been re-erected. The spacing is very irregular at places, ranging from 69 feet apart, centre to centre, to 8 feet 9 inches and 5 feet 3 inches approximately. It would appear that although the original spacing may not have varied to such an extreme degree as above stated, as stones may have been removed from where are now gaps, yet at no time can any great regularity have existed. Commencing at the northern end of the associated rows, we find the largest stones and the most regular spacing. 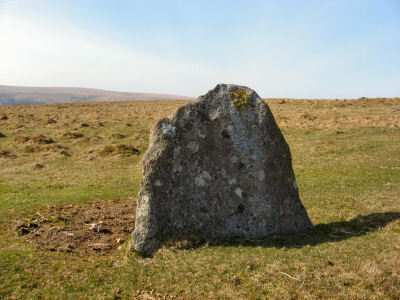 After a series of fourteen stones, one of which has been left fallen, as its pit-hole was not discovered, and the general direction of which is 5 degrees west of south, we come to a circle which closes the row, and has apparently consisted of eleven stones, one of which has, however, been considerably displaced, and is not shown on plan. The irregularity of the circle renders it somewhat difficult to state its original diameter, but an approximate value of 16 feet would probably be fairly accurate. This circle was merely one enclosing a ruined cairn. 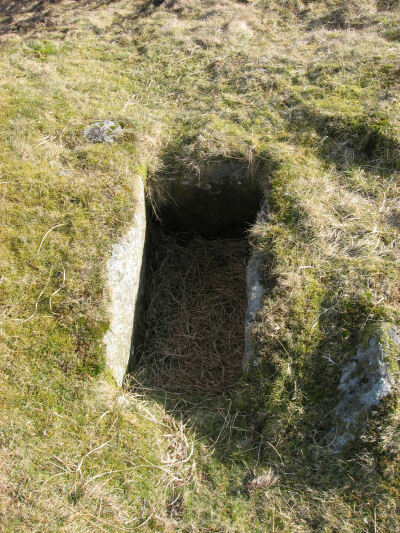 The burial could not be found. 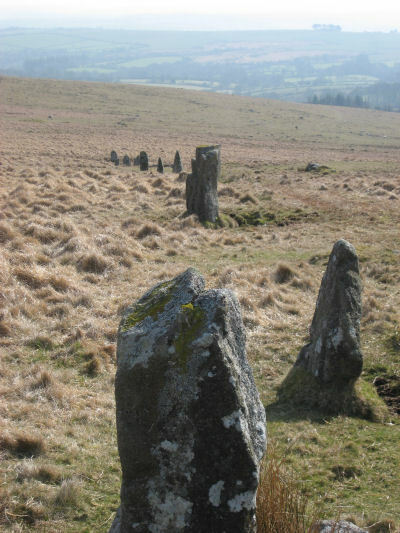 With this first row are associated two cairns, the one to the westward of the row being 26 feet in diameter, and having the possible remains of an enclosing circle of stones. The centre of this cairn is 226 feet distant from the line. On the eastern side, and at a distance to the centre of 136 feet 4 inches from the line, is another cairn, without any trace of an enclosing circle, and 37 feet in diameter. From the western side of the circle ending the northern row, and tangential to it, starts the second stone row, at first in a direction approximately parallel, but afterwards trending distinctly to the westward. This line of stones trends in the direction of a cairn, and there are indications that it led to and ended at it; but all this portion of the row has been pillaged for the formation of a wall to a plantation. On the slope of the hill to the west is a fairly perfect but small kistvaen. The coverer has been carried off, probably for employment in the construction of the wall. 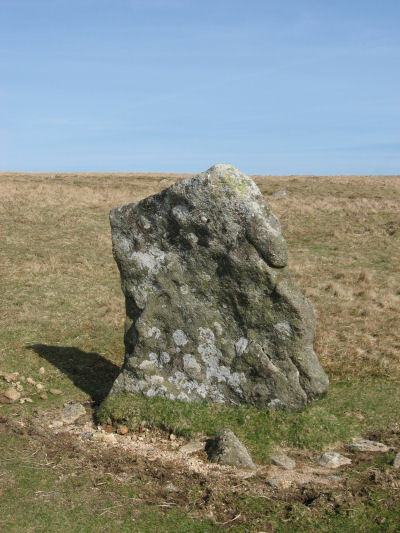 This site is featured on the Ivybridge 2: West Erme - Burford, Stalldown and Erme Rows and Cairns walk. These photos were taken on Stalldown Barrow (SX63216207 Butler Vol. 4. Map 54: 4, 18).The first set of photos is of the settlements on the southern slopes of Stalldown Barrow. 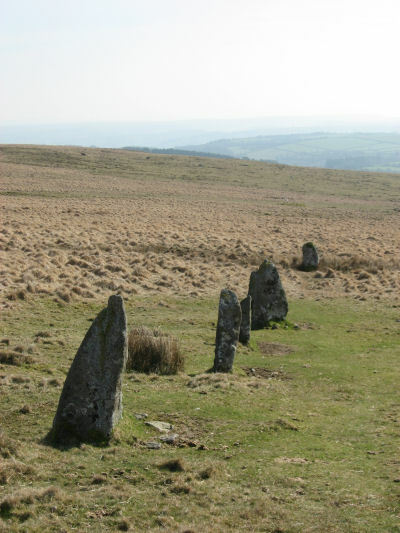 The enormous size of the stones used in the Stalldown stone row makes it one of the most impressive rows on Dartmoor. The row can be clearly seen at quite some distance on the south western slopes of Stalldown Barrow. The row was in a ruinous state with most of the stones lying flat when it was restored by Baring-Gould in 1897. 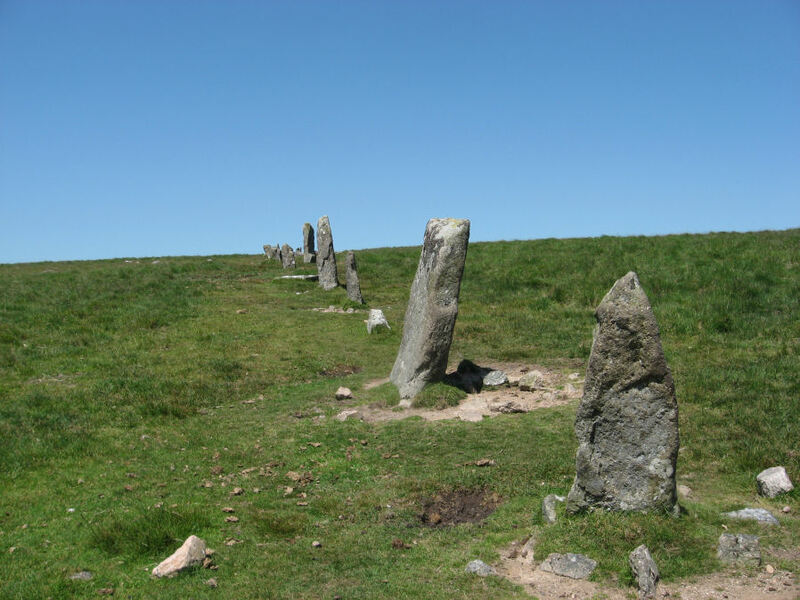 The restoration claimed to only use the original sockets for the stones but Worth claims that the row would not have originally aligned to the small circle of stones making the cairn just over the crest of the hill heading south. Butler suggests the curve westwards by 14° of the row as it passes over the crest of the hill is indeed an original feature of the row. The north end of the row has six particularly large pillars. There are a number of cairns on Stalldown. Butler lists 11 cairns in the vicinity. Butler's Cairn 1 is the circle already mentioned which can be seen in the 10th and 12th photo of the row below. The row cuts a line of cairns laid out across the ridge of Stalldown. The most prominent is about 0.5Km to the East of the row on the highest point of the ridge and includes Hillson's House (Butler's Cairn 7). In line with the row about 1Km north at the base of the hill are Cairns 8 & 9. 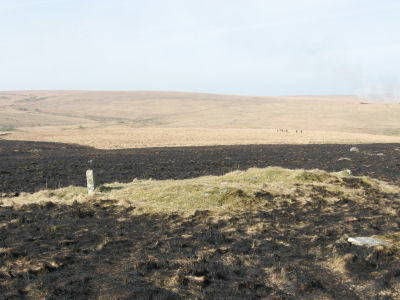 The day these photos were taken there had been controlled burning off which made finding Cairn 9 particularly easy as it appeared as an island of green in a burnt off area. 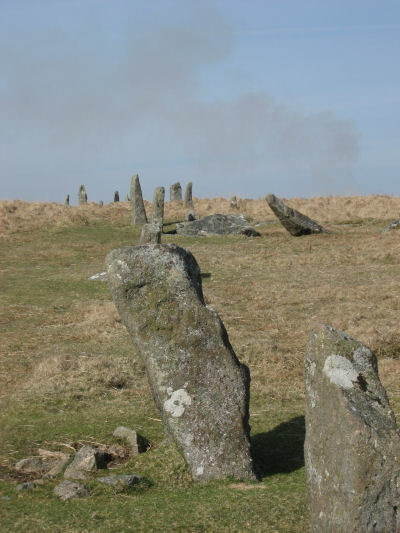 Cairn 9 is about 11.5m across and the sides and end stone of a cist at the centre can be clearly seen along with an outer ring of small stones around its base. These photos were taken on the 19th March 2011.